2019 Harley-Davidson CVO Street Glide. Picture credits - Harley-Davidson. Submit more pictures. Get the power of the Milwaukee-Eight� 117 V-Twin engine, red rocker covers, premium custom paint, premium Talon wheels and custom controls, all-new BOOM!� Box GTS infotainment with 3 separate amplifiers, 75 watts per channel and 900 watts of clear audio performance on the CVO� Street Glide�. There�s a wireless headset interface that lets you use your Bluetooth� headset to communicate with infotainment system, passenger and other riders. The list also includes heated grips. Price as new (MSRP): US$ 40889. Prices depend on country, taxes, accessories, etc. Ask questions Join the 19 Harley-Davidson CVO Street Glide discussion group or the general Harley-Davidson discussion group. Enter your e-mail to join the 2019 Harley-Davidson CVO Street Glide forum and get notification of answers and new messages about this bike. You can unsubscribe with a single click. Bikez does not display, sell	or misuse e-mail addresses. Get a list of related motorbikes before you buy this Harley-Davidson. Inspect technical data. Look at photos. Read the riders' comments at the bike's discussion group. And check out the bike's reliability, repair costs, etc. 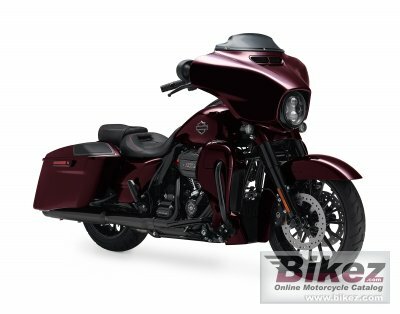 Show any 2019 Harley-Davidson CVO Street Glide for sale on our Bikez.biz Motorcycle Classifieds. You can also sign up for e-mail notification when such bikes are advertised in the future. And advertise your old MC for sale. Our efficient ads are free. You are also welcome to read and submit motorcycle reviews.